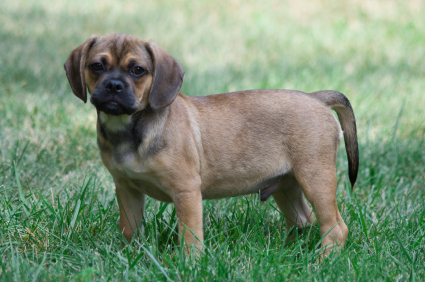 Pugaliers are a cross between a Pug and a Cavalier King Charles Spaniel. They have the basic appearance of a Pug but breeders have deliberately bred them to have a slighty longer nose to make breathing easier. Their ears are longer than those of a Pug due to the Cavalier Influence. They grow to be larger than the Pug. Dogs don’t come much more friendly than the Pugalier. Both the Pug and Cavalier King Charles Spaniel love their human families and that has been passed on to the Pugalier. They are great for kids and get along well with other pets. Most Pugaliers have the short coat of the Pug and are very easy to look after. Some Pugaliers do have the longer Cavalier coat and will need a brush.